Procyon lotor is more commonly known as the raccoon. They are 61 to 91 cm long and have a distinctive black mask with a ringed tail. The raccoon’s nocturnal exploits have earned it a place throughout American culture. They are best known for their curious and mischievous nature, especially when it comes to trash cans. Many home and business owners are forced into protective measures so their refuse isn’t scattered on a nightly basis. In fact, such actions earned the raccoon movie roles like the one in The Great Outdoors. It’s hard to believe that such a pest has earned both our ire and affection. Typically, raccoons prefer to inhabit hollow trees and logs near lakes and streams. They are known to venture into populated areas, becoming a nuisance as they search for refuge and forage for food. Raccoons will also use existing structures to construct a den. 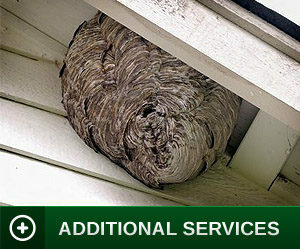 Some of their favorite habitats are the areas beneath porches and outbuildings, attics and chimneys. During the months of spring and early summer, diet consists primarily of insects, frogs, fish and crayfish. 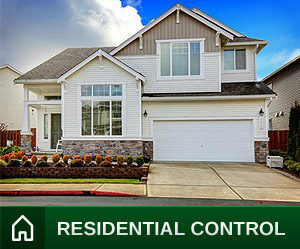 They are known to roll back sod in search of earthworms and grubs (doing significant damage to lawns). During late summer and fall, raccoons move to nuts, grains, berries, fruits and sweet corn from gardens. Whether local residents or simply foraging, easily observable signs of raccoon activity are damaged lawns and raided garbage cans. Raccoons are omnivores and will eat both plants and animals. Some of their common plant-based food sources include seeds, fruits, berries, acorns, nuts, and grains such as corn. 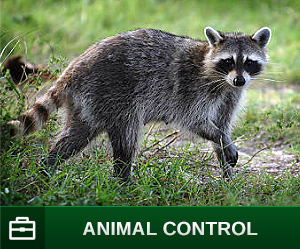 Raccoons frequently eat animals like crawfish, fish, clams, snails, insects, frogs, and mice, as well. 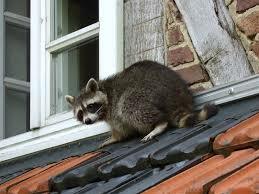 Raccoons also consume chicken and other kinds of bird eggs. Another common source of food for raccoons is waste generated by humans. 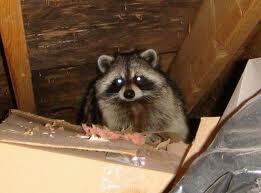 Raccoons are frequently cited eating out of homeowner garbage cans. The mammal also prefers to consume uneaten pet foods left outside. Raccoons are very social animals within their family groups. They mate from February to March, and females carry the young for approximately 60 days. A standard litter produces three to five young. At about 2 months of age, the young raccoons will begin accompanying their mother on outings to find food. The family group usually stays together for about one year. Upon maturation, an adult raccoon will vary in size from 61 to 91 cm in length and 4.5 to 13.5 kg. Raccoons are their own sign. The others signs can be their feeding damage, such as overturned trash cans or partially eaten garden items, such as corn or melons. Another sign can be the structural damage they may cause as they try to enter buildings, such as into attics.